Do you need a day to focus on your oncology massage practice? 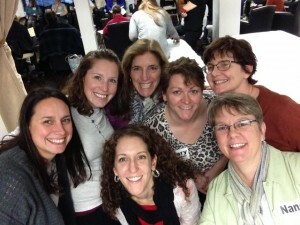 Could you use ideas and support from a group of experienced OMTs? New in 2016! 7 CE Hours (NCBTMB and NY state approved). Gather with our teaching staff, a group of experienced oncology massage practitioners, for a day focused on your success in the field. Learn how they have grown their oncology massage work from a calling into a service, and how they have made it into a full, satisfying livelihood. We’ll start with panel discussions on private practice and hospital based massage, with plenty of time for questions and answers. Tracy Walton will offer a research update on oncology massage and symptom relief, focusing on the best use of research to promote OMT in your practice. Breakout sessions on clinical issues will include a short hands-on refresher, with an emphasis on client retention and comfort. Finally, small group coaching sessions will be tailored to the common needs of oncology massage therapists, then we’ll round out the day with some open discussion and Q&A. It will be a day of ideas, inspiration, and camaraderie. What is Special about this Course? The Approach. This is a course on practice-building. Your foundational oncology massage course focused on the clinical aspects of oncology massage. This collaborative, collegial event is more like “Notes from the Field,” or what we have learned from practicing OMT for a long, long time. By sharing our insights, we hope to help you build your practice effectively. Perhaps we’ll even save you some work, or help you to hone your own direction. We’ve planned the student:teacher ratio for this course at about 4:1. In your foundational course, you might have shared 3 instructors with 25 people. What Else is Special? All that Experience in One Place. One unique feature of this course is the sheer number and experience of the instructors! We’ve planned for eight instructors to attend. Taken together, our instructors have accumulated 125+ years in massage therapy. As a group, they also have 65+ years in massage education. They have logged 80+ years in oncology massage. Each instructor has at least 500 contact hours with oncology clients, most have much more than that. Our instructors are strong, contributing members of their communities. Each one has had to innovate in some way to get their work out in the world. Each one has insights and experience to share with you, along with moral support. This live, face-to-face, in-person course will be the first time we’ve had so many instructor-practitioners in a classroom at once. It is the first time we’ve been able to combine formal presentations and informal small-group work, with plenty of chances to ask your burning questions about building your practice. A Day about Marketing, Right? Not exactly. When people think of practice-building, they often think only of marketing. This is not a marketing course, although marketing will likely come up during the grand swap of ideas, and will be part of each panelist’s remarks at the opening panel. Instead, we’ll be painting with a broader brush, covering as many elements to a successful OMT practice as we can cover, with as many perspectives as possible in a 7-CE hour day. This course is for anyone who has taken a foundational course in oncology massage therapy, recognized by the Society for Oncology Massage. It is not designed for MTs starting out, without prior training, hoping to get into oncology massage. MTs with other background or coursework may be accepted, depending on space and instructor approval. Just email us to ask, below. SNOW DATE is Sunday, February 7, 2016, 9:00 AM – 5:00 PM. Please clear your calendar for this date if possible, because of unpredictable Boston weather in February. We will be in touch with you by e-mail earlier in the week if the weather looks threatening. Tuition: $177 if registered by Friday, January 8, 2016. $207 thereafter. A foundational course in oncology massage therapy. Either our 4-day or 3-day intensive, or any foundational course recognized by the Society for Oncology Massage. This is not designed for MTs without oncology massage training, but if you are curious about whether it’s a fit for you, please email us. A wonderful classroom at the Elizabeth Grady School of Esthetics and Massage Therapy in the Boston area (Medford, MA). Parking is plentiful. Whole Foods and Starbucks are around the corner. Massage tables are supplied. If you’re driving, please bring a couple of pillows and a couple of bath towels. Snacks for yourself. Snacks to share with others, if you like. A mug. We’ll serve tea. Join us for lively discussions. Join us for fun, collaboration, and expertise, all in one place. Space is limited, we recommend signing up soon. We don’t know when this course will roll around again. Click below for the brief, formal course description. If you want the full day layout, read on. This course is TBA; we hope for the next offering in 2018. Go beyond the basics of clinic oncology massage, and learn how accomplished practitioners have grown their work from an initial calling into a service. This course begins with a panel of oncology massage therapists sharing insights from their successful private practices, followed by another group of OMTs sharing experiences from their work in hospital settings. Later, Tracy Walton will present an oncology massage research update, along with guidelines for using the research results in OMT outreach and marketing. Learn the difference between a solid research claim and a weaker one, and use the solid claims to promote your work. A choice of one of two clinical sessions will follow. In one, we will address how to introduce gentle pressure to clients expecting deep work, and in the other, we’ll practice client positioning and supports for pain relief. Small groups will focus on common challenges in oncology massage therapy, and both small- and large-group Q&A will be offered. This is a collaborative, collegial event, a course focused on support for individual OMT practitioners as well as the larger presence of OMT in the world of cancer care. List and implement four outreach and practice-building techniques in support of a private practice in oncology massage therapy. Identify three factors to consider in choosing the best practice-building techniques in a given area. Describe three potential challenges of practicing oncology massage in the hospital setting, with solutions that OMTs have used to overcome those challenges. Identify three ways that oncology massage therapy positions may be structured in the hospital setting. List four strong research studies in support of oncology massage and their conclusions. Summarize the state of current oncology massage therapy research and one ethical and accurate claim to be made about it to the public in promoting massage for cancer care. Locate three resources in support of effective oncology massage therapy practice-building. What are some strategies that have worked for MTs in private practice? Here’s your chance to ask questions and get support from five of our instructors who are longtime oncology massage therapists in private practice. Two of our instructors have growing staffs of therapists working for them. Two have renovated buildings to accommodate a group practice or tenants. Another divides her time between a studio, mobile practice, and retirement center. One specializes in lymphedema care as well as general massage therapy. All on the panel specialize in oncology massage as well as seeing general clientele. Hear them share how they built their busy practices doing work that they love. There will be time for Q&A, and you’ll leave with a handout of their key recommendations. Massage therapy is growing to be a part of outpatient and inpatient cancer care. Hear stories from three of our teachers who have worked or taught in hospitals or cancer centers. Learn how their jobs are (or were) structured, the day-to-day responsibilities, reporting, charting, and patient care. Ask questions about their challenges and triumphs across five different cancer care settings. Session 3. What is the Oncology Massage Research Telling Us? Good research is essential to making strong claims about oncology massage, yet much of the existing research on massage is overstated. Tracy will introduce some of the elements of good research, and highlight a handful of oncology massage studies that make the grade. She’ll offer useful research insights and measured statements for your outreach and marketing materials. 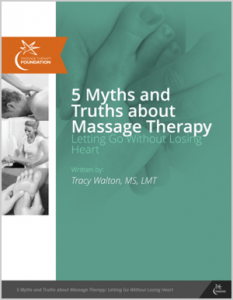 From these discussions and a thorough handout, you will leave with clear, humble, but accurate claims to make about the role of massage on symptom relief. In this session, learn some good language and techniques for communicating with clients in those difficult situations. Work with a teacher to provide gentle massage therapy that is more than just touch, in a way that feels deep, satisfying, and may just win over the client who wants deeper work. Our clients tell us our bolstering and positioning is not just relaxing, it also reduces cancer pain and stiffness and helps them sleep. You can help your clients get more from the massage session by supporting a neutral spine and all 4 limbs in creative ways. In this session, depending on your comfort with the side-lying and supine techniques taught in our foundational course, you’ll either review the basics, or go on to practice prone techniques, all with close tableside supervision. Work out the kinks in your bolstering to offer smooth, simple support for your clients. These techniques will be done clothed. In these informal sessions, you’ll receive small-group attention and answers to many of your questions about making the work actually work for you as well as your clients. We will survey you ahead of time about the challenges and questions you are facing, then organize small groups around some common OMT issues and themes that are raised by you and your classmates. There will be a chance for questions and discussion with the whole class and entire staff before we close for the day. Visit our Training Schedule to sign up. NOTE SNOW DATE and EARLY REGISTRATION DISCOUNT DEADLINE on the Training Schedule. Have more questions about this course? Want to know specifics? Send us your questions and thoughts.